February 1st, 2013 - SAF Adds 20' Press Brake to It's California Branch - SAF - Southern Aluminum Finishing Co, Inc. SAF – Southern Aluminum Finishing Co, Inc.
Atlanta, GA – February 1st, 2013 – With the recent acquisition of a new 175 ton AccurPress 240” precision press brake, SAF-West can now supply the architectural market with 20’ long formed sheet metal. 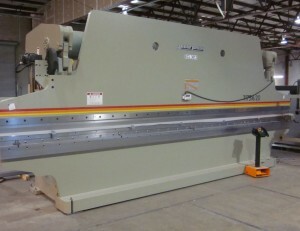 Close on the heels of opening their new California anodizing line, adding the press brake to their existing fabrication equipment complements SAF’s other products and services such as shearing, welding, and routing capabilities. Some advantages of 20’ material are better optimization of materials used, reduced installation labor, and the removal or reduction of potentially leak prone joints and seams.The new capability will improve SAF’s goal of being a one-stop nationwide supplier of architectural metals. SAF is a mill-direct purchaser of aluminum coils and distributes the coils, cuts sheet distribution, or fabricates the sheet to a customer’s specification.With a 67 year history, SAF has grown from a regional aluminum distributor, finisher, and fabricator into a worldwide supplier of architectural metals. SAF has gradually expanded their Western presence since 2003, opening it’s Redding, CA. branch to distribution and fabrication in 2007. SAF began anodizing at the new facility in December, 2012. “This new press brake will enhance SAF’s position as the leading architectural metal fabricator in the United States offering a breadth of capabilities not available anywhere else under one roof” says Penn McClatchey, SAF Co-CEO. Penn directed the opening of SAF Metal Fabrication’s Villa Rica, Ga. facility in 2002. Today SAF Metal Fabrication operates with 100 employees in 100,000 sq. ft. which SAF hopes to duplicate in their California plant. Brake forming involves positioning sheet metal in between a punch and a die and lowering the punch down into the sheet metal resting on the stationary die which bends the sheet metal. The die is mounted on the frame and the punch is on the hydraulically powered upper beam. The shape of the punch and die along with the amount of applied pressure determine the angle of the bend.